It’s clear that Shakespeare never noshed on lutefisk. If he had, he would have written: There’s something rotten in the state of Norway. To honor the Lutesons for pulling knit watch caps over the sailors’ eyes, the lye water and cod recipe became a cherished Norwegian food. But even those who sing its culinary praise add one or more caveats: It’s an acquired taste. I eat it only at Christmastime. It takes some getting used to. Smother it with butter. You’ll want to mix it with mashed potatoes and lots of mustard and cover it with bacon gravy. Which begs the question: Why spoil a good plate of mashed potatoes and greasy gravy? The truth is, lutefisk is vile no matter how it’s disguised. It has been described in taste and texture to Fish Jell-O. Remember when your mother gave you cod liver oil, followed by orange juice to make the medicine go down? It didn’t work, did it? Potatoes, butter, gravy, mustard, and bacon won’t help lutefisk, either. Small town churches (usually Lutheran) often host lutefisk and lefse suppers during the holiday season. Lefse is potato bread baked on a hot griddle like pancakes. While those merry parishioners in native costumes once worn by their ancestors kick up their heels to accordion music, another congregation down the street most likely has a sign offering a “Non-lutefisk Spaghetti and Meatball dinner.” That’s the place to go. Kountry Kookin’ Café, in the rural community of Viborg, South Dakota, population 850, serves lutefisk on Monday nights, in season. There’s a season for lutefisk? 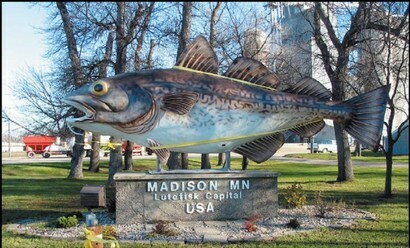 A marquee on a Minnesota motel advertises: “Lutefisk—It’s not just for breakfast. Ask about our meal plan.” Another Minnesota town has a lutefisk contest, but they don’t eat it, they toss it, not unlike a sack of haggis at a Scottish games festival. When either of those foods is eaten, there’s always the possibility of it being tossed––in a manner of speaking. Seattle’s lutefisk eating contest gets hundreds of applicants, but the dining table is limited to twelve. The honored dozen say the competition is about tradition, nostalgia, fortitude, and building character. Osseo, Wisconsin, holds an annual Lutefiskman Triathlon (canoeing, biking, and running). No word on what lutefisk has to do with the competition, but one might suspect the participants are paddling, peddling, and racing away from having anything to do with eating the triathlon’s namesake. The world’s largest processor of lutefisk, Olsen Fish Company in Minneapolis, produces over a half million pounds per year. They have a Hotline (800-882-0212), with directions on how to cook the fish. Before you call, consider this description of lutefisk found on the Internet: It’s like marshmallows without sugar mixed with overcooked Japanese noodles, bathed in acetone, marinated several days in cod liver oil, heated to lukewarm, sprinkled with thousands of tiny, sharp, invisible bones, and served hot. If that doesn’t whet your appetite, this song won’t help (sung to the tune of O Tannenbaum). O, lutefisk, O, lutefisk, how fragrant your aroma. O, lutefisk, O, lutefisk, you put me in a coma. You smell so strong, you look like glue, you taste just like an overshoe. That slimy slab we know so well, identified by ghastly smell. O, lutefisk, O, lutefisk, our loyalty won’t waver. There are as many recipes for lutefisk as there are Scandinavians in Minnesota. Some boil the fish, some bake it, some microwave it. One recipe reads: Get some white cod. Lay it on a pine board. Flatten fish with a meat cleaver. Salt and pepper fish and add butter. Bake on board for 30 minutes. Remove from oven. Throw out lutefisk and eat the board. Having married a Dane, I’m thankful this branch of Scandinavians has more sense. I never faced the prospect of being served lutefisk at my in-laws’ house. There was some talk about blood pudding, but the dish never materialized, so let’s not even go there. My in-laws did, however, force their young lad to attend the annual Sons of Norway Father and Son Lutefisk and Lefse dinner with a neighbor, Thorvald Knutson, who had no son. My husband still pinches his nose when he hears the word lutefisk. This is the fellow who, on a visit to Zimbabwe, ate deep fried mopane worms. That tells you something about lutefisk. It’s been said that half the Norwegians who emigrated to America in the late 1800s came in order to escape lutefisk. The other half came to dispel its soiled reputation by spreading the word about its delightfulness. Reportedly, more lutefisk is eaten in the United States today than in Norway. Many Norwegians spurn the so-called delicacy because they associate it with peasant food. Some call it a national disgrace. How about we give these folks credit for wising up and not buying into the tradition and heritage malarkey? Bring on the roast turkey, sage stuffing, and cranberry sauce. Skoal.